Oliveira C, Candelária I, Oliveira P, Figueiredo A, Caseiro-Alves F. Metallosis: a diagnosis not only in patients with metal-on-metal prostheses. Eur J Radiol Open 2015;2:3–6. Sink E. Postponing total hip arthoplasty: the role for capsular arthroplasty in developmental dysplasia of the hip. 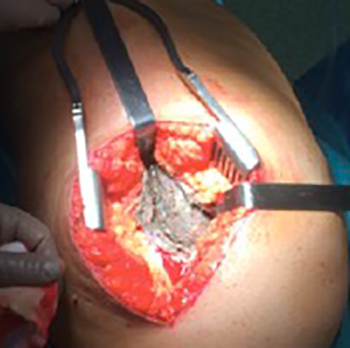 JBJS Orthopaedic Highlights: Hip Surgery 2012;2:e5. Amanatullah D, Sucher M, Bonadurer G, Pereira G, Taunton M. Metal in total hip arthroplasty: wear particles, biology, and diagnosis. Orthopedics 2016;39:371–379. Birkett N, El-Daly I, Ibraheim H, Mbubaegbu C. Metallosis following full thickness wear in total hip arthroplasty. J Surg Case Rep 2015;2015:rjv122. Loyo E, Jara L, López P, Puig A. Autoimmunity in connection with a metal implant: a case of autoimmune/autoinflammatory syndrome induced by adjuvants.Auto Immun Highlights 2012;4:33–38.